Cut or find a few tree branches. Make sure the base of the branches are flat. Measure the candle width you plan to use and use the appropriate drill bit to make the hold for the candle. In this example we drilled the hole using a 5/8th inch spade bit. 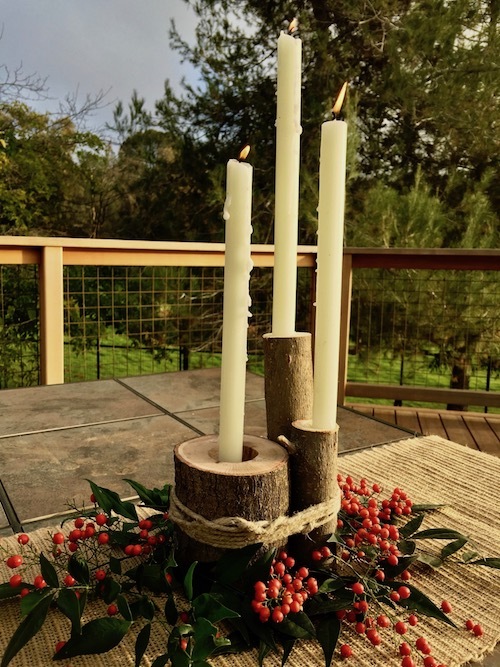 Wrap and tie the branches together with twine, ribbon, or whatever you have. Drip plenty of melted wax into the hole to stabilize the candle. Great for anytime of year! Enjoy!